AIS offers an extensive range of industrial computing and HMI solutions that include a vast multitude of configurations for industrial, commercial, and hazardous applications. With new technologies such as Internet of Things (IoT), Industry 4.0 and IT/OT convergence taking hold in business, AIS is fostering new control and visualization solutions to address these new and burgeoning opportunities with our commercial and industrial applications. Take control and monitoring to the next level with AIS open and embedded architecture HMIs. They come with advanced performance and connectivity in an all-in-one, rugged industrial design. The new family offers an extensive selection of models in different screen sizes ranging from 4” to 24”. Utilizing both single touch and multi-touch screens, projected capacitive technology, AIS guarantees a range of display options that meet all customer requirements. Engineered, designed and manufactured 100% in-house, AIS’s offering includes: hazardous areas HMI, industrial monitors, industrial panel PCs, rugged displays, and rugged panel PCs designed for use in harsh environments and extreme operating conditions. 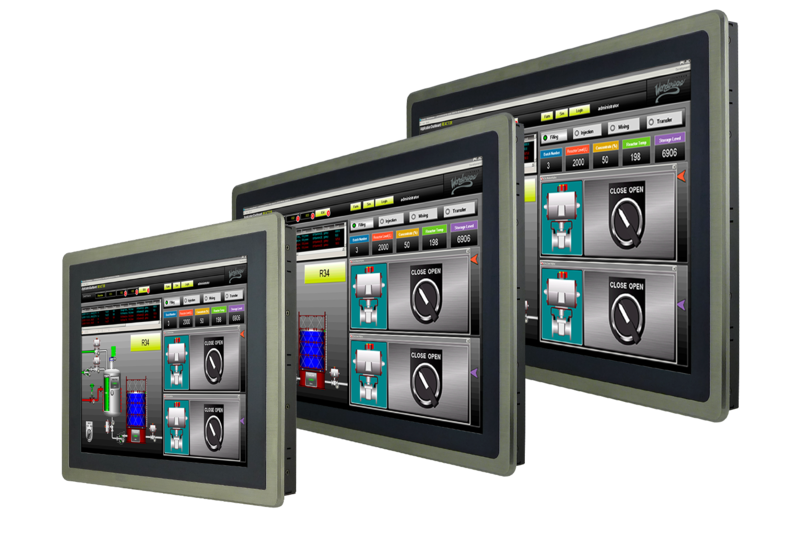 AIS next generation HMI Touch Panels Series are engineered to meet the increasingly complex processes of machines and automation systems while simplifying operation and programming. Using open and standardized interfaces for embedded computing allows easy and efficient integration for almost any machine, application or environment. AIS Industrial Touch Screen HMI’s open-architecture also allows compatibility with Programmable Logic Controllers (PLC), Supervisory Control and Data Acquisition (SCADA) systems, Manufacturing Execution Systems (MES), Distributed Control Systems (DCS), Industrial Control Systems (ICS) and Field Service Management Systems (FSM). An open platform HMI ensures network security and enables users to leverage new Industrial Automation, Web Browser, Field Mobility, M2M, Industry 4.0 and IoT applications. 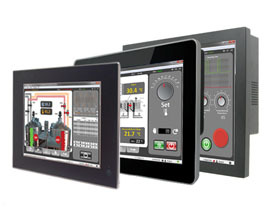 The next generation of HMIs including the new Premium, Standard, Compact and Comfort Line are available in displays with both analog resistive single-touch and projected capacitive multi-touch, ranging from 4” to 24” screen sizes. AIS Automation Panels and Mobile Panels are rugged and certified (UL 61010-1, 62368-1 and Class I Division 2, ATEX and IECEX Zone 2, CE Marking and CB Scheme) for automation, information and communication applications while providing maintenance-free products for harsh and/or standard industrial environments. AIS’s new and revolutionary industrial Artificial Intelligence (AI), machine learning, computer vision, IoT-enabled and GPU-powered embedded computing systems are engineered to meet the increasing computing demands of the next generation of control, visualization, and machine intelligence applications with integrated high-performance and energy-efficient NVIDIA® GPUs, CUDA®-enabled APIs, Intel® Xeon® and Core™ processors, are built to meet the demands of harsh industrial environments. Leveraging flexible, standardized communication interfaces and extensive software API support allows for easy and efficient context-aware computing integration into almost any robot, machine, cloud-based, and big data applications, or industry such as healthcare and life sciences, automotive, agriculture, manufacturing, energy and utilities, transportation, and autonomous factories. The advantages of AIS’s new Industrial PCs (IPCs) including Panel Industrial PC, Box Industrial PC, DIN-rail IPC, Thin Client IPC, and Embedded IoT Gateway series are many. 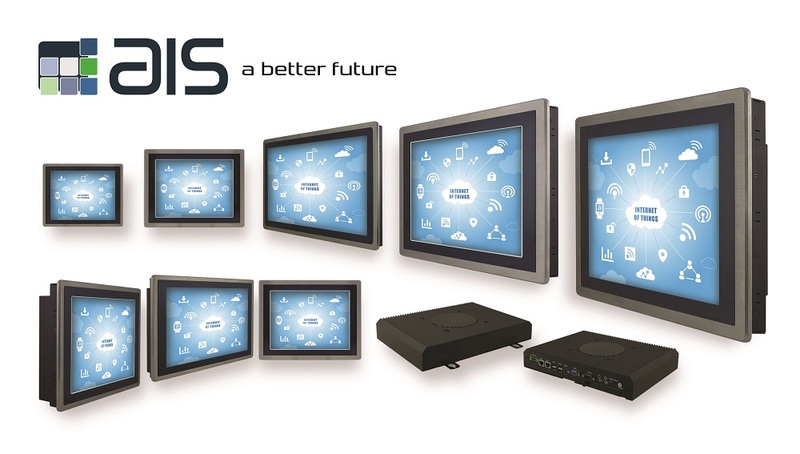 The AIS IPC and IoT embedded automation computer offers a high-performance computing solution and flexible I/O interface and display options that helps in supporting multiple networks, systems, sensors, and displays. AIS industrial PCs and industrial computers used on the plant floor and are ruggedized to be used in harsh industrial environments. The trends towards Industrial Internet of Things (IIoT) and Industry 4.0 will lead to increasing demand. Owing to the rapid growth of computer and communication technology, manufacturing areas are becoming more automated, increasingly deploying intelligent devices to monitor and control unmanned facilities. The AIS IPCs and IoT computers provide more Ethernet-connected devices, a closer connection between plant floor and office, and a dependence on big data and the associated analytics to enable industrial organizations to improve performance and agility and reduce costs. AIS IoT IPCs offer the promise to increase production flexibility, which typically involves a broader usage of robotics. These IoT industrial PCs are used for various applications including medical, military, industrial, and transportation. 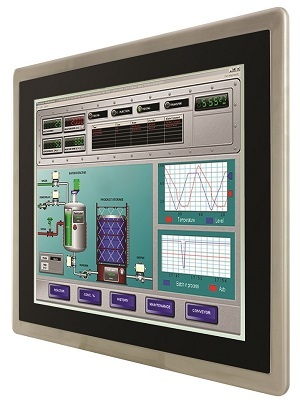 AIS offers 15-22" HMI panel PCs with international approvals for operation and monitoring and for use directly in hazardous areas with modular designs. AIS HMI panel PCs are constructed with completely sealed stainless steel type IP66 and NEMA 4X enclosure with environmental ratings on the entire HMI system including fully sealed I/O ports. AIS offers UL Class I Division 2, Groups A, B, C, D, ATEX 94/9/EC Zone 2, IECEx Zone 2 certification on its hazardous locations panel PCs and open HMI platforms which are primarily designed for the volatile and harsh environments of oil, gas, chemicals, and oilfield equipment and services. AIS industrial multi-touch panel PCs and rugged multi-touch panel computers are reliable, durable, and provide industrial OEMs and packaging machinery manufacturers with vast selection of industrial embedded computing technologies and solutions that help customers simplify Internet of Things (IoT), M2M, PLC, HMI, or SCADA applications. AIS budget-priced industrial panel PCs and high performance computing panel computers are all-in-one industrial computers with fully integrated wide range of industrial-grade LCD flat screen sizes, touchscreen interface, Intel's comprehensive embedded processors and chipsets, low power consumption, fanless design, scratch-resistant , and anti-reflective mineral glass screen capabilities; designed specifically for HMI display, visualization and control solutions. 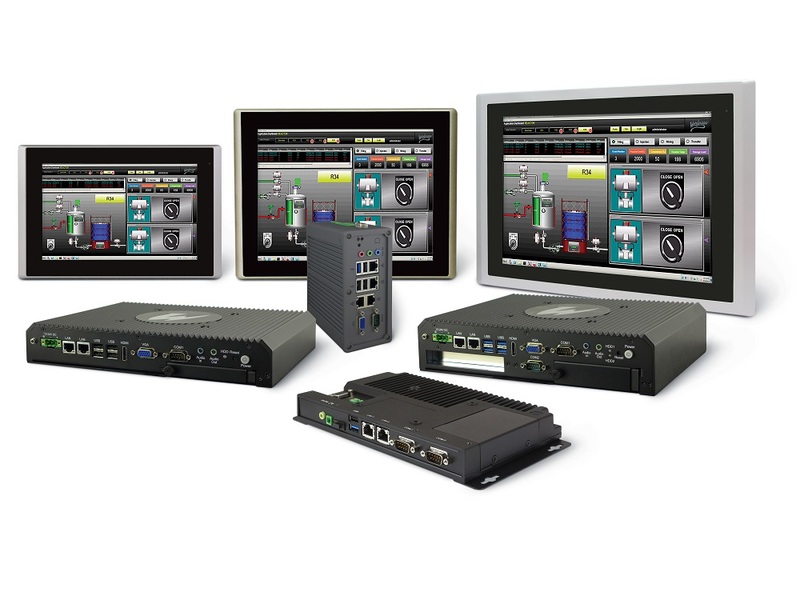 AIS also provides other human machine interface solutions, including Power over Ethernet (PoE), wide temperature range, widescreen LCD flat panel, IP66 stainless front flat panel mounting, and open frame flush mounting touch panel PC computers for a wide variety of industrial applications. AIS industrial touchscreen panel PC computers are designed for industrial, process manufacturing, discrete manufacturing, industrial automation, building automation, process control, machinery manufacturing, and custom machine to machine interface applications. 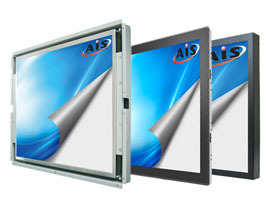 AIS full range selection of industrial displays are offered in screen sizes ranging from 7" to 22". AIS rugged displays are reliable, durable, and provides industrial OEMs, oil, gas, and petrochemical manufacturing industries with a vast selection of ruggedized touch screen technologies and solutions. AIS rugged monitors includes hazardous areas industrial monitors, stainless steel displays, and marine displays featuring: UL Class I Division 2 (C1D2), Groups A, B, C, and D, ATEX Zone 2 and IEC-Ex Zone 2 certification, rugged touch screen technology, waterproof and dustproof capabilities, wide temperature range, high brightness, high resolution, and outdoor sunlight-readable capabilities, all designed-in to allow reliable operation in harsh usage environments and conditions, such as strong vibrations, extreme temperatures and wet or dusty conditions. AIS offers UL Class I Division 2 (C1D2), Groups A, B, C, and D, ATEX Zone 2 and IEC-Ex Zone 2 certification on its hazardous locations industrial LCD displays which are primarily designed for the volatile and harsh environments of oil, gas, and petrochemical manufacturing industries. AIS full-range selection of industrial rugged monitor displays are offered in screen sizes ranging from 15" to 22". AIS industrial multi touch display monitors and industrial LCD monitor displays provide industrial OEMs, machinery and kiosk manufacturers, as well as automation control and process systems with highly reliable and durable products offering a vast selection of technologies and solutions that help simplify all aspects of machine to machine interface applications. AIS industrial monitor LCD displays series with HMI interface features the latest in TFT-LCD flat panel and multi-touch capacitive touch screen technologies, wide temperature range, high brightness, sunlight-readable, widescreen LCD flat panel, energy saving LED backlighting, scratch-resistant, and anti-reflective mineral glass screen capabilities, industrial TFT-LCD modules with forward compatibility, low EMI technology, long-life and easy replacement lamp/LED. Various mounting options include: flat panel mounting with IP65/NEMA 4/4X Ingress protection rating, flat panel wall mount, open frame flush mounting surface, and flush chassis mount designed specifically to cater to interactive display and visualization applications. These industrial monitors are ideally designed for industrial automation control, manufacture of machinery, touch screen kiosk, rental kiosk, mall kiosk, payment kiosk, retail kiosk, outdoor kiosk, interactive digital signage, and custom machine to machine interface applications. AIS full-range selection of industrial monitor displays are from 8.4" to 22" screen sizes. 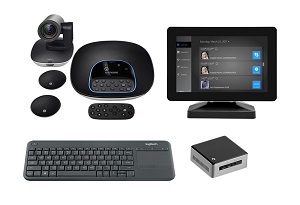 AIS’s conference room scheduling solutions offer affordable processing, easy deployment with products based PoE technology, and Intel® NUCs that may be customized, pre-configured and tested for video conferencing solutions.